3 What Can The Knife Handle? 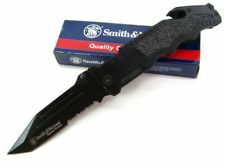 The Smith and Wesson company who is well known for their excellence in firearms, now offer prestige knives as well. 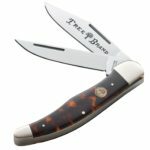 The Border Guard Knife is one of their premier models and it is expected to be out in front in sales as well as its usefulness in the field. Having gone through a barrage of tests recently, it held up remarkably well. What Can The Knife Handle? 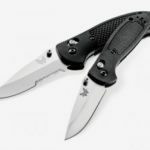 This knife is a heavy-duty liner lock configuration that is geared to handle the kind of difficult work that anyone would expect from a rescue knife. 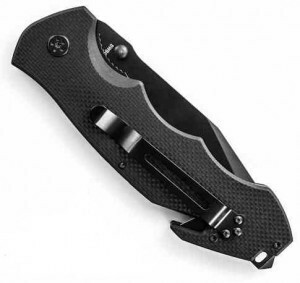 It has a large blade of over 4 inches, making it a little bulky to play the EDC role, but would make it perfect for tactical situations. 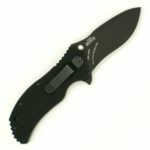 It is an ideal knife for first responders with its seatbelt cutter and glass breaker. Sometimes one can get a little leery of heavy liner lock knives, but there was no problem the batoning and chopping wood. 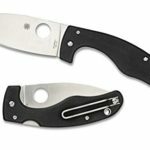 It would take sound judgment to use it in that fashion, and it certainly won’t chop firewood, but it will hold up well for any duty for which you would use a heavy folder. Out of the box, the blade is razor sharp and there was no problem putting a hair-shaving on it after it had dulled. One problem was that it tended to quickly lose its edge. The steel for the blade is not the greatest, as it was decided to use 4034 stainless steel, but it is evident that the cheaper steel was used to keep the price of the knife less, and that is a positive. The knife is easy to sharpen, which makes up for the edge dulling so quickly. If you are going to use the knife only once in a while, that should not be a problem, but if you are going to use it every day and give it a workout, another choice of knife would make more sense. Smith and Wesson didn’t skimp on the blade, as it is 4.4 inches long. There are several blade options, a popular one being the tanto with the serrations at the bottom of the blade, which is great for thrusting and penetration. The serrations are also very good at cutting through rope and cord, but they are difficult to sharpen, of course. When the knife is sharp, it is very sharp, as I was able to easily cut through paper. The dual thumb-studs suitable for one-hand opening is a good option, as I found that operation to be very smooth and quickly done. 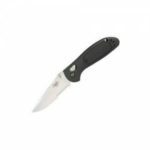 The handle of the knife consists of black anodized aluminum and features pillar construction so it is very easy to clean. The handle is textured for an easy grip and the indention on the bottom makes it easy to position the fingers in a variety of optional grips. Since the handle is 5.6 inches long, there is never any fear of the knife slipping out of your hand. The included glass breaker and the seat belt cutter being included is nice, except the belt cutter was a bit dull, as it had to be sawed back and forth, so using the serrated part of the knife worked better. The glass breaker worked just fine. One problem with the whole setup is that the pocket clip is held in place by three Allen screws and it allows for a right-handed mount only. 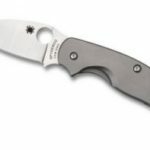 It is hard to understand why knife makers don’t allow for left-handers, and it would not be difficult to fashion a grip for both left and right-handed users. The clip also comes lose constantly, so the Allen screws have to be re-tightened all the time. Other than that, this is a servable knife that will be adequate in the field for an inexpensive price.